I woulde like to talk about Gonta’ｓ　ｓｋin condition. loosing blood from his bald with scab. His ears look so big, because he doesn't have much fur on his face. I noticed it is Yoda in Star Wars. By the way, Speaking of ears Gonta's ears are beneficial to himself. He doesn't hear anything I say except words benefit to himself. Eeven if I speak in a loudvoice. his ears are very efficient, even if I say them in any low voice. I mean it isn't my mind. Seeing buddhist sclptures is one of my hobbies. As soon as I hear there is a unique buddhist sculpture. I love buddhisut sculptures,so I'm not so interested in"Kansai Kannon Pilglimage"
but there is a "Chomei temple" which is not so far from my house. I decided to go there with Gontapapa. He doesn't like to go temple at all. Chomei temple has eight hundred steps of stone stairs. We have to go up the stone stairs. It is said that Chomei temple is the difficult place where our kees begin to shake. Of course we didn't go up the stone stairs. There are one hundred stone steps from the parking lot though. Gontapap decided to stay in the car. Each step was big , so I was tired. I was worn out but we could have a big panoramic view of Lake Biwa. 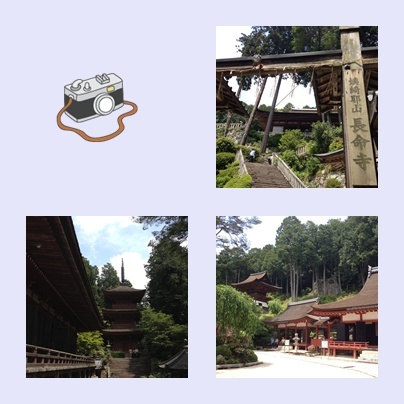 Chome temple was a good temple with a elegant and composed appearance. You must go up from the bottom. I prayed Gonta's long life and went home. Gonta says"I heard papa was waiting for mama at the parking lot." The scarecrows standing on a scarecrow road changed their clothes. It looks like their clothes was so dirty because it had been worn over the winter. 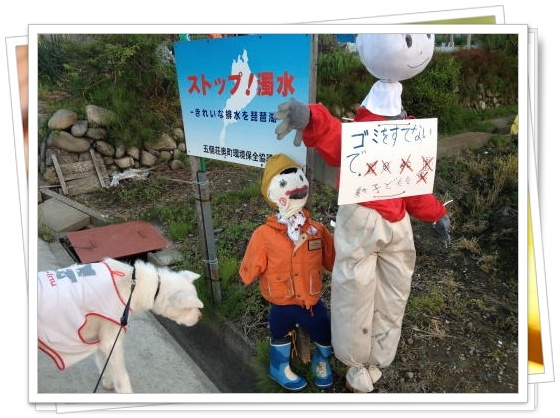 This time there were scarecrows of a parent and a child ,too. Gonta thinks there is a good points, and he tries to pee there. Earnestly ,between you and me. Did you watch a TV program called 「日本の犬」? It was broadcasted by the NHK BS plemium on Friday. 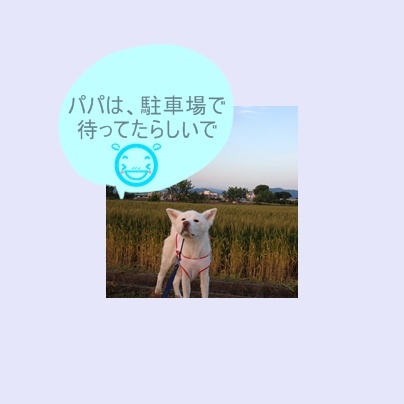 柴dog,　北海道dog, 秋田dog,　紀州dog ,　四国dog. a bond with each other playing roles in association with people. 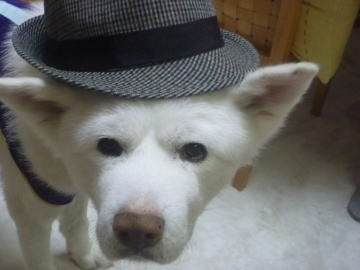 The program introduced six kinds of dogs with anecdotes. I was especially impressed by the story of mixing of Gon. 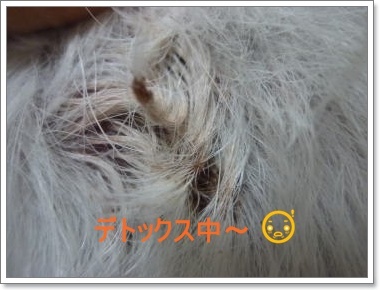 That is a cross breed of 紀州dog. He guided pilgrms　toward deep in Kouya mountain. 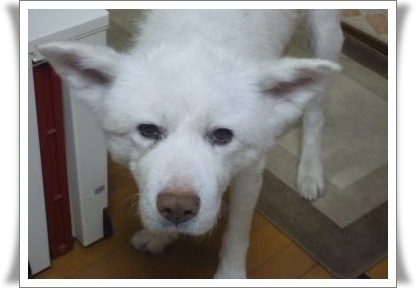 I was also impressed by the story of 秋田dog,Shiro. 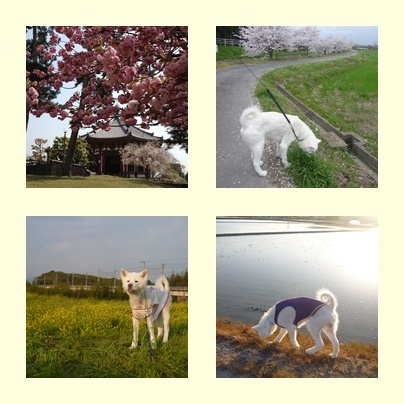 I think it is a good program for people who love Japanese dogs. Did you miss the program? It will be broadcasted tomorrow morning again. May twenty second on Wednesday from eight A.M.
"I feel better" Gonta said. 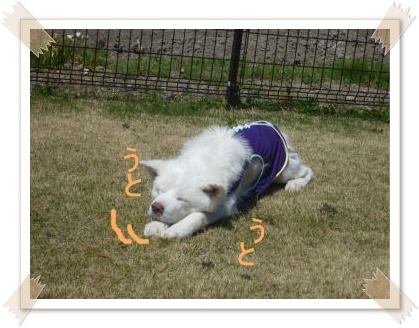 I love Japanese dogs after all. He has energy to walk around the kitchen. His immune cell did its best. love to dear Chibi may have boild. When Gonta is sick like in this case, I wish he would tell me which part of his body hurts. Anyway I was relieved that he was much better. Gonta is a faithful day isn't he? Gontapapa was so impressed by Gonta's this attitude. Therefore papa gave up his bed smothly. This is a picture of Gonta occupying papa's bed. This morning Gonta didn't wake up as usual. I took him for a walk but he didn't want to walk. 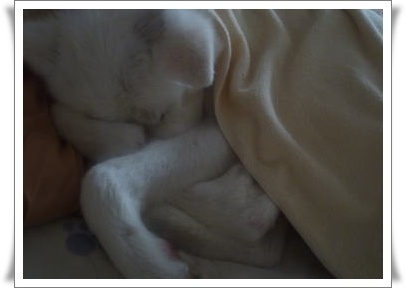 He had a high fever. His temperture of the head was different from the usual. And also the colour of the urine was dark brown. He wanted to go home and lie down. And his hind leg started to tremble. Is this for a fever? For the time being I decided to see how it would go for a while. He had no appetite, but want to drink some water. 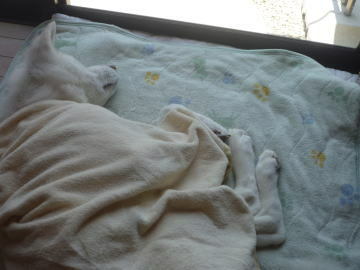 Around noon his trembling stopped but he continued to have a fever. Hip,hip, hooray, Gonta's immune cell. I thought tyey were in sympathy with each other thought, they were male. But the other day I found our that Chibi is a girl. 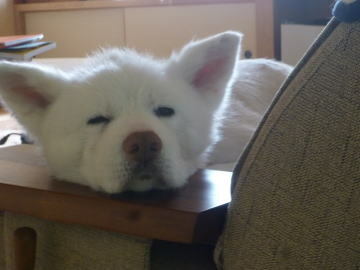 And also Chibi is still four years old, a fresh girl. 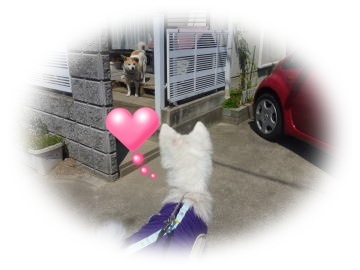 Recently when Gonta visited Chibi wagging his tail,Chibi was out. Oh! 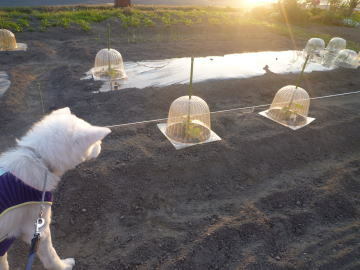 Young plants of vegetables are wearing a hat for avoiding the cold. I tried wearing a hat too, to cover my bold-head. Papa worked hard in the garden. Mama had a inflmmation of the bladder, which caused blood in the urine. So she shut herself in the restroom. I slept all the time.